I like warehouse clubs. I especially like Costco. To me, Costco is to Sam’s what Target is to Wal-Mart. They have a really wide variety of quality merchandise at good prices. Or are they so good? It can be hard to tell when you are required to buy in such huge quantities. What about the annual membership cost? Rather than being an extreme penny pincher who tracks the cost of multiple commodity items at multiple stores all the time, I try to find one or a few staples that I think are going to be a huge savings and compare them. If I can save enough on them to make back my membership cost, I’ll join. For years, this was simple. Melanie’s job was the litter box but, rather than scoop, she replaced the litter once a week. The savings in cat litter paid for the membership in no time. Now that we don’t have a cat anymore and our membership is up for renewal, it was time to do a little directed comparison shopping. After we run, we drink a smoothie for breakfast and a snack. It almost always has pomegranate juice, strawberries, blueberries and broccoli in it. While tasty, these things are fairly expensive. I knew the pomegranate juice was a big savings over any place else I’d checked but I wasn’t so sure about the other frozen stuff. We also decided to check facial tissue, toilet paper and paper towels. This was more to make sure we weren’t getting ripped off. I actually prefer to buy these items in bulk. Really, who wants to have to think about these things more than a couple times a year? As long as you don’t live in a small apartment, you have the space to stuff some paper products that will never spoil. Attached you will find a chart of our results. The short answer is yes, Costco is a great deal for us. Once you take out the $50 membership, we still save at least $130 per year. Keep in mind, that the list is limited to items we buy fairly regularly. We also only compared it to Publix. Why not Sam’s or Wal-Mart or <insert name>? Because this is a practical comparison. We don’t shop at those other places enough or at all to make the comparison worthwhile. I did not compare identical products only. This is a real world comparison. 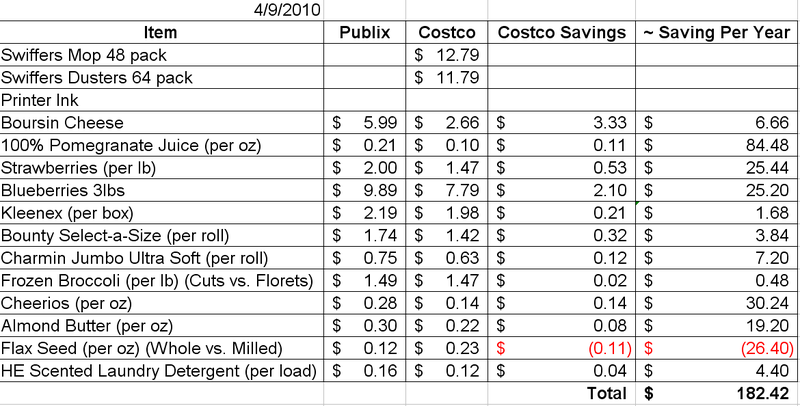 If Publix-brand paper towels are cheaper and acceptable, they go up against Costco’s Bounty. I’m comparing what I’d actually buy from each establishment. Two items do get gypped a little bit. Costco only sells frozen broccoli florets (the top part) but since they get blended, we just get the cheaper broccoli cuts from Publix. At the time we checked, Publix didn’t carry milled flax seed. So it is a comparison of milled vs unsmashed. Since you only get the benefits of flax seed if it is broken open, this was more of check to make sure we weren’t getting reamed by Costco on this item. You’ll also notice that there are a few items that are incomplete. Those are basically reminders to me for future checking. I think printer ink could be a great deal here. What are some other reasons to shop at Costco? What else should we look at buying there (besides the two-seat go-cart)? The big box retail kills its competitors on reason 1. Saving time and gas can sometimes even beat sales and coupons. I love your spreadsheet. Those price values, while fluid, are a good snapshot comparison. Sale prices, I think, are where your real savings come. The way you and Mel cook, I would think any sale on meat would be an easy grab for a Sunday cook-fest. We LOVE those patties. I like that they don’t pretend to be sausage. They just taste great. You should try them on these Rosemary and Parmesan Drop Biscuits from America’s Test Kitchen. Simple, fast and the best, Jerry! The best! Even better if you have your own rosemary bush (which you should, Ms Greenthumb). I didn’t mention it but I did factor in the gas to get there and back. It is a hike for us too, but we only go once a month. Like you, I can’t imagine doing regular grocery shopping here, but my point is that staples that you can stock up on make sense. You cover your membership cost and then if you need an expensive item, like a new TV, they can be another good option. Meat is a whole ‘nuther story. It is a huge deal for Melanie to get humane and healthy meat. For this reason Costco is out. We couldn’t eat it in their portions anyway. I use http://www.coastalcontacts.com/ for my contacts (with online discount codes) but I’ll compare with Costco next time I have to buy. So my question is about broccoli… specifically “since they get blended, we just get the cheaper broccoli cuts” … blended?? Yes. Blended right in to the smoothie. You don’t really taste it too much. A growing boy has to get veggies somehow. I used to make smoothies for the boys a lot. That way I knew that they’d get their veggies in during the day! Great idea to use broccoli. I used spinach, and, blended fine enough, you couldn’t tell it was in the smoothie!